According to Alexa, YouTube is the third most popular website on the planet, closely behind Google and Facebook. The main difference is that people will pay tens of thousands to advertise on Google and Facebook but often forget about the opportunity YouTube can offer for SEO. Personally, I have always been a fan of YouTube, mainly because it is so easily overlooked as an SEO alternative. Anyone can use it and it's a totally free source of fun advertising. Uploading a video takes only a few minutes, it's completely free and as long as it doesn't break any of the site's rules it can stay there indefinitely gaining traffic. There are a few ways to gain traffic from a YouTube video, one of the most popular of which is adding a link in the video description along with adjacent text. Adding annotations to a video is also a good way of converting viewers to visitors, the pop-up can be a bit annoying but with the right timing you can capture the viewer's attention just when they want to know more. Last September, I started an experiment and have had some great results from what started as a five-minute video upload to something that has had over half a million views worldwide. Over a nine-month period, my video has generated 557,000 views, which has converted the five minutes it took me to upload into 6,625 visits to my site. Each visit has also turned into 2.52 page visits per user with an average time of 1.47 minutes; 96% are visits I otherwise would have missed. 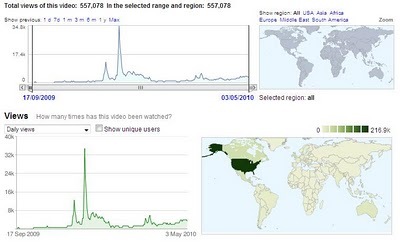 At peak, a video reaching over 34,000 page views a day has turned into only 600 visits per day. Although the initial conversion from YouTube to the site is low, it is still 600 visits a day I could have missed. Since YouTube has been bought by Google it has also seen a rise in traffic. Plus, with the new-look Google, a YouTube video will often be the first link visible at the top of some SERPs. This also means YouTube is the cheapest and one of the easiest ways to get to the first page of Google. You can't argue with the stats and when it's really this easy to make something generate visitors to your site at a minimal one-off cost - it's well worth giving it a try.